How has the dream of our Founders been allowed to fall so low? It is obvious to any man of reason that the once great nation of the United States of America is not even a shadow of herself. 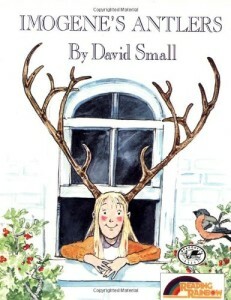 You will find no acknowledgment of this simple truth in Imogene’s Antlers, which is just one of the many flaws I have divined in the moments I spent studying its cover. SJWs always lie. It is amusing to consider the conceit of a woman, a mere slip of a girl, as the protagonist of a book. Whatever trivial discomforts her misadventures pose to her, she would be better served to be a homemaker and allow someone with a greater genetic predisposition towards intelligence such as a man so solve them. Oh ho, do you think that was sexist? How amusing that you have fallen for my cunning trap. I didn’t say that all women are genetically the intellectual inferior of all men, did I? I said that this one individual, being a woman, is the intellectual inferior of another individual, being a man! How very like an SJW to miss that and leap to tar me with vile calumnies which cannot be backed up! Proof once again that SJWs always lie! This is because SJWs rely on rhetoric, using loaded emotionally overwrought words like “evidence” and “proof” and “here is a link to Theophilus saying that women should not be allowed to vote” and other suchlike appeals to feelings, while I, with my eminently logical mind, operate solely in the syllogistic realm of the dialectic except when it amuses me to resort to more rhetorical modes, which is frequently. And so I have outsmarted you once again. But do not take it too hard. Based on certain key demographics coupled with unmistakable signs I have calculated my own IQ as +3 SD. I always phrase my IQ in terms of significant standard deviation rather than irrelevant numbers to show that I am not some mere dilettante who took on an online test. No, I am an expert who took an online test, and then adjusted the result upwards to account for the superiority of my genetics. Genius though I am, even I can barely fathom how terribly intelligent I am. What hope have you? I am a master gamesman and you are all my pawns. My skills have been honed over the course of many hours arguing rules around a table full of Ral Partha miniatures. Unless you would have me believe that the master craftsman in the Divine Workshop could not equal the elegant simplicity of the rulemakers in the Games Workshop, you cannot convince me that this has not left me in top condition to deal with any and all situations I might encounter. Alone, I am mighty. With my Baleful Cohort behind me I am unstoppable. I sneer at your polite assumptions about how humans should interact with each other in order to have a functional society. Is there a bowl of candy at your reception desk for visitors to snack on? I refuse to merely graze at it like cattle. I will have it all. Your social contract means nothing to me. Your take-a-penny, leave-a-penny tray does not impress me. I will take a penny. I will take all the pennies. I will not leave a penny. You will stare in open-mouthed horror at your empty penny tray just as the Germanic hordes once stared at the Roman pila whistling through the air at their skulls. You are the Germans in this analogy. Are you in an elevator with me? I will void my intestine of flatus the instant the doors close. Hold your mealy-mouthed objections about what is and isn’t done. I don’t care. Is there a rule against it? There is not. Is there a law against it? There is not. You who would politely hold it in are like a two-dimensional being faced with an invader who can move in not three or four but seventeen separate and distinct dimensions, and you had best clutch your pearls tightly because no fewer than five of those dimensions involve intestinal gas. I once fouled the air while sharing a taxicab with Theresa Nielsen Hayden and then stuck her with the fare, telling her I would get it next time. Of course my incredibly subtle and complex stratagem comes with an insidious barb on the end: there has been and will be no next time, and neither she nor anyone else can do anything about it. If I would do such a thing to she who commands the unquestioning loyalty of every SJW, do you think I would do any less to any of you? More the fool you! I have heard her conspiring against me, saying, “I seriously would not share a cab with that guy.” How amusing that she thinks allowing me to overhear this whispering campaign would dissuade me from such conduct. Obviously the only reason she would warn someone else about my behavior is she thinks I will feel bad and become meek and compliant and docile as a result of her chastisement. How arrogant and typically self-centered of her to assume that her feelings mean anything to me! It is as amusing as it is instructive. I’ll say it again: I don’t care. I am immune to the feelbads and SJWs do not know what to do about this. I am like a sinkhole destroying their roads and they put signs up all around me saying “CAUTION: SINKHOLE” as if they believe the mere act of putting up a sign can fill in a hole! This is why the SJWs fear me. This is why they are so fascinated by me. I know. I watch them. Constantly. Especially John Scalzi . He is a man obsessed. If you ever wish to see for yourself what a man in the throes of a deep obsession looks like, come to me and I will furnish you with details of his daily routine along with the best vantage points from which to observe him unseen. Sometimes I see him pacing his living room for hours at a time. What could drive him to such distraction, I ask, if it isn’t me? Don’t think that I won’t. This entry was posted in Noisy Nonsense, SPRB and tagged satire, sprb by Alexandra Erin. Bookmark the permalink.